Early this week I went to Paris for the day, entering a most fresh and beautiful spring atmosphere. 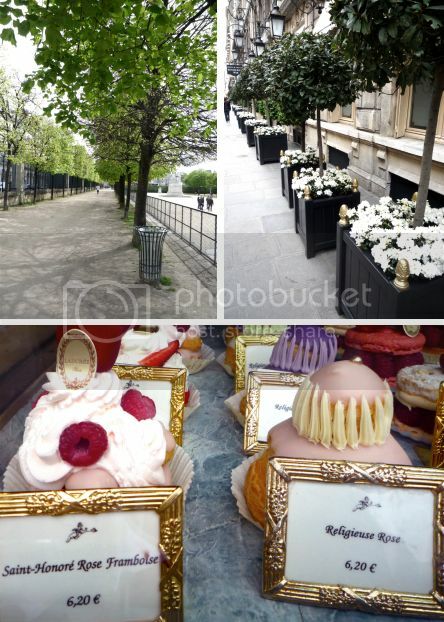 Here a few snaps taken while strolling around.. left the clipped trees of the Tuileries Gardens, right the bay trees along side the Hôtel Crillon on the Rue Boissy d'Anglas, and below some of Ladurée's delectable patisseries. 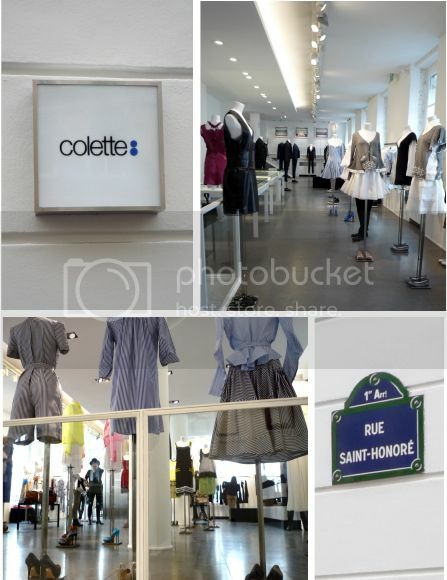 After visiting FSH, I continued down the Rue St Honoré until No 213, where the über trendy and cool Colette store is located. 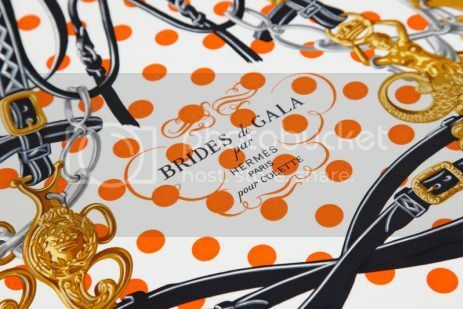 Last year, Colette and Hermès collaborated on the 'J'aime mon Carré Project, and came up with a special edition polka dot Brides de Gala.. This year Colette and Nike teamed up on the 'Away Project', and on March 28 launched the new 'away kit' of the french national footbal team (Nike is the sponsor of the team), consisting of products created by Hermès, Chanel, YSL, Ladurée, Comme de Garçons and six others (eleven in total, like the number of players in a football team). 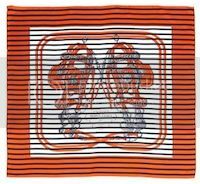 All products have blue stripes, and Hermès' contribution is a stripey Brides de Gala, currently sold in the boutique and via Colette's online boutique in a limited edition of 300. 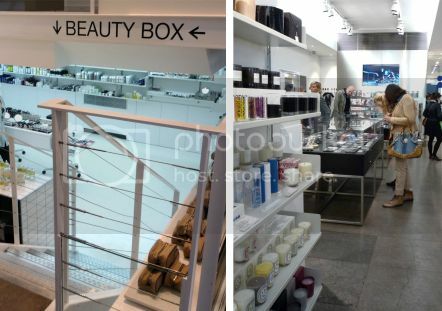 And tucked away, inbetween floors, the 'Beauty Box'. On the ground floor you'll find an eclectic mix of scented candles, latest techno gadges, canvas sneakers and bags, girly bathsalts, sweets, CDs, books and hundreds of other small items. The windows were decorated with pretty sumer dresses of Stella McCartney's spring/summer collection, and I only realized at home that a stylish bypasser walked past the second I took photo, she looks as though she has stepped right out of the display! Ahhh MaiTai, your fresh Spring pictures of Paris and Colette made my day... The woman passing by in the photograph does look very chic.... Thank you for sharing your recent Paris visit. Can't wait for the photos of the FSH windows! Lovely pics MaiTai - thanks for sharing! Everything looks just lovely! Counting the weeks now until we're there! I live vicariously through you and your trips to Paris, MT. Thank you for sharing these lovely pics. I'm looking forward to the FSH windows. Dear Mai Tai, thanks for posting pictures of Paris! I miss Paris already!! LOL! Thank you so much for sharing those beautiful photographs of Paris in the Spring with us. Paris is magical, no doubt about that, and the way you present it to us makes it even more magical! I can hardly wait to go there myself. Is there any place on earth more beautiful than Paris in the spring? I highly doubt it. I will have to settle for Paris in the fall, but I certainly thank you for allowing a glimpse of the springtime magic. And, those FSH windows in your latest post - jaw dropping! Ah the cakes!! Hermes is luckily just around the corner, my dear Lilian, so you can have both ;) We had a hot week too (over 30 degrees) but hopefully some cooler spring scarf weather will come to all of us soon! In answer your question, my dear Jerrine, Paris in fall!! 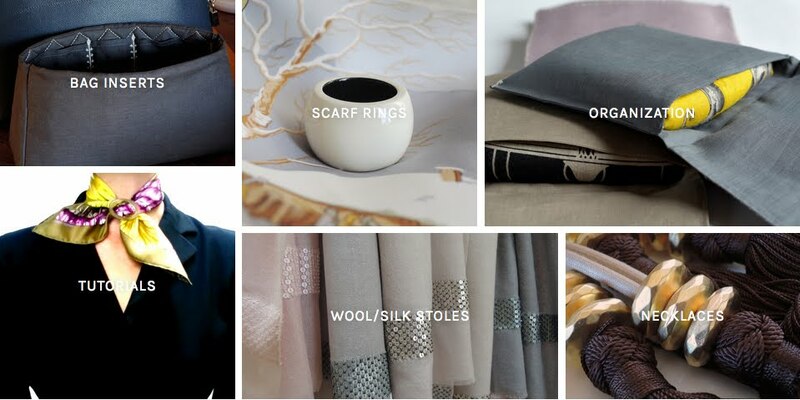 The golden autumn leaves go perfectly well with the Paris’ grandeur, and the crisp air will calls scarves.. such fun!